Over the past few weeks, several readers have contacted me and asked if I had heard about an herbicide named Imprelis. I had read about it, in passing, but hadn't had the time to look into it in depth. I just got the chance to look into it further and have discovered that DuPont, the manufacturer of Imprelis, has halted sales of the product and is planning a product return and refund program. Additionally, they have setup an entire website, called Imprelis Facts, to answer questions about the product. 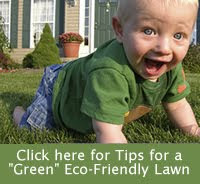 If you utilize a landscape service to maintain your lawn, you might want to ask them if they use Imprelis. I tried to dig a little deeper and find out why it was first thought to be environmentally friendly. I only found a vague mention of it being "less" toxic to mammals. Today we have treated your lawn with an innovative weed control product from DuPont. The product label requires that you do not use grass clippings from areas treated with Imprelis for mulching or compost, or allow for collection to composting facilities. Grass clippings must either be left on the treated area, or, if allowed by local yard waste regulations, disposed of in the trash. As usual, my recommendation is to stay away from herbicides and other lawn chemicals whenever you can, even if they are listed as being more environmentally friendly.